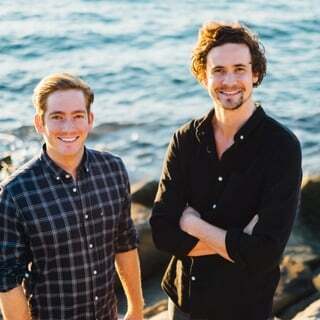 So you want to get into the Western Australian Academy of Performing arts – fantastic. WAAPA is one of the best drama schools in Australia, and one of the best drama schools in the world. This is a comprehensive guide for how to get into WAAPA. This article is mainly aimed at those looking to audition for the acting course at WAAPA. Many of the principles discussed are relevant if you are auditioning for musical theatre, but the layout of the audition will be slightly different. The Western Australian Academy of Performing Arts acting course is incredibly well respected, both nationally and internationally. With Alumni including Hugh Jackman (Wolverine), Francis O’Connor (Cleverman), Jai Courtney (Suicide Squad), and more recently Dacre Montgomery (Power Rangers), and Ben O’Toole (Hacksaw Ridge). And many other graduates from this elite course can be spotted on screens and stages all over the world. Being an elite course, it only accepts 18 students a year. The course is three years of intensive, full-time study. WAAPA is therefore very selective and only about 1%-4% of the actors who auditioned, actually get in. So it’s important to be fully prepared and understand what is required of you at the audition. 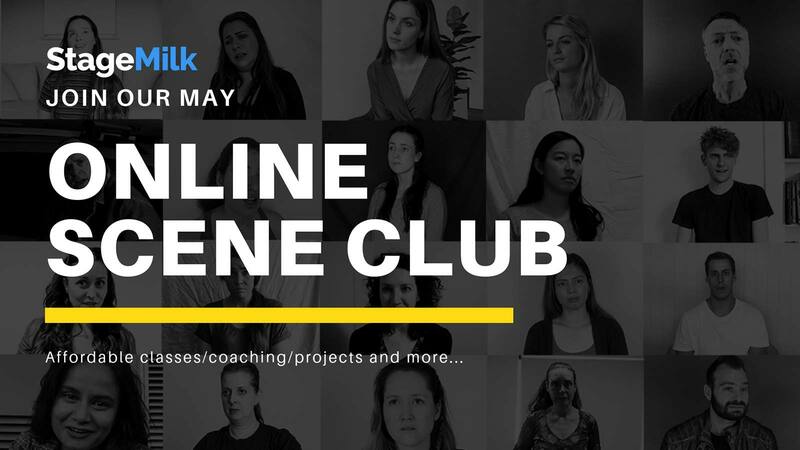 Before you even begin preparing your acting work for your audition, read through everything on the website about the audition process and the course. Not only is there valuable information including dates and deadlines about the audition that you should not ignore, there is also information about course structure and year dates. As with other elite, full-time acting courses, it is not like a standard arts degree where you have low contact hours and the option to choose your timetable. It is a rigid timetable of 30-50hrs per week, and which requires almost 100% attendance, so make sure you are ready to take the plunge. 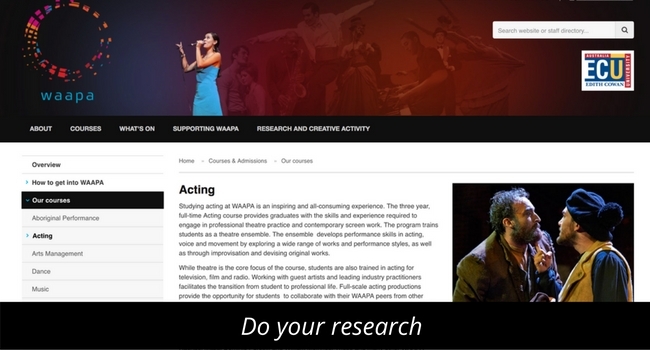 To learn more about the course check out the WAAPA site. Ask yourself whether this kind of full-time program is right for you. If you are from interstate, it is also worth thinking about whether you are up for making the move to Perth. From personal experience, moving interstate to study was less intimidating than I thought. WAAPA has cultivated a very supportive environment, and people are more than willing to help you get settled. The majority of students attending the WAAPA Acting course are from interstate, so there are lots of people in the same boat. To audition for WAAPA you will need to choose 2 monologues from their list of monologues (these are updated every year, but remain fairly similar). One modern, and one Shakespeare. Make sure you read all the monologues before making a selection. Ideally you would read all the plays that the monologues are from, but if that’s too much, just read the plays of your favourite few. This is very important, as it will likely inform which monologue you choose. Don’t just take a monologue at face value. There will always be important context to consider once you have read the full play, and it will provide you with a wealth of information about the character, and what they’re going through. It is imperative that you choose monologues you know you can do well and you should choose two contrasting pieces to show range (e.g. a comedy and a drama is a great combination), but don’t choose something just to ‘stretch’ yourself. Play to your strengths, and save taking big risks for when you’ve gotten in! Don’t ignore stagecraft! You are auditioning with theatre monologues, and even though the course is designed to create talented, versatile actors that can work on any stage or screen in the country, it starts as a theatre course, so do not ignore basic theatre techniques. If you are only interested in acting on screen, then I recommend applying and auditioning for a specific screen course, because a screen audition style will not suffice for an audition like this. For more information on theatre auditions see: HOW TO AUDITION FOR THEATRE. VOCALLY – Can I be heard? Do I get too quiet? Or do I shout and get too loud? Learn more about mastering your voice. TECHNIQUE – Am I pausing too much? (this is a VERY common mistake) Am I acting in between the lines, or on the lines? (you should be acting ON the line) Am I indulging and ‘watching’ myself act? 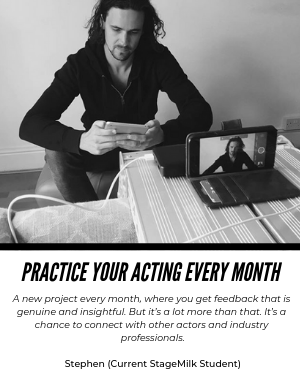 Get your acting technique sorted. PHYSICALLY – Am I rigid? Am I working on tension? Am I moving too much, or too little? Does my movement work with the text, or against it? This is a great movement video to check out. Firstly, this sentiment applies to your monologue. Deliver your monologue the way you have prepared, but be ready for them to redirect you, often in the opposite direction. Don’t resist direction, even if it feels wrong, commit to it as best you can. Actors must be flexible. They must be able to explain their choices, but not be precious with them. So during your prep work, consider how it could be directed, and have your lines learned well enough that you can make big changes without being thrown. The panelists at your WAAPA audition will definitely test you if they like your work. Whatever you do, don’t hold onto your original acting decisions. They want to see how you take direction! Secondly, for a lot of people, the audition process for WAAPA is the first insight into the world of acting training, and what is expected from a creatively stimulated and committed actor. A lot of the exercises may seem strange if you haven’t done any training, but resisting them, or being self conscious about how you look, will get in your way. So be open and receptive to whatever the auditioners throw at you. You don’t have to have years of experience to get in. It’s your acting that counts, so relax. Believe it or not, the auditioners are on your side. They are hoping you come in and blow their socks off, so don’t position them as the enemy. Don’t let nerves overcome you, just get up and do what you’ve prepared for them. The best way to keep nerves at bay is to be prepared, so get up in front of some friends you trust, or other actors as a mock audition, just so the panel isn’t the first group to see you perform. For more advice on keeping nerves at bay go here. Something to keep in mind is that WAAPA is looking to accept an ensemble of actors. They don’t want 18 blondes, or 18 brunettes, or 18 white people, they want a diverse group of people that can play a variety of roles, and provide the industry with an eclectic group of actors when you graduate. So with this in mind, don’t try and re-invent yourself for the audition, and don’t be concerned with trying to act like someone else, or even comparing your audition with someone else’s. All you need to be is the best version of you, because you being you, will give you a point of difference. Trying to copy someone else’s style, or blending in, or playing your perceived ‘type’, will make you easily forgettable, and destroy your inherent uniqueness. When you walk into the audition be genuine and direct. You will typically start by having a chat with the panellists. They love to see students who have opinions. Talk about a great play you’ve seen, or why you think WAAPA is the school for you. Your CV isn’t that important at this stage, so don’t try to fluff your experience or previous training. What matters is that you do great work on the floor and that you will work well in an ensemble for three years. Tip: at all drama school auditions there are either current students, or recent graduates, that help out on the day. Be nice to these students as they have influence. People have missed out on recalls because of how they interact with the people helping on auditions. Don’t be a diva. What is the WAAPA audition process like? Every drama school has a slightly different audition process. NIDA does group auditions, which can be a great learning experience, but WAAPA and a few others offer private, one-on-one auditions. You will be given a specific audition time and will have around 15 minutes with the panellists. The panellists are typically the head of acting and another acting teacher, though this can vary depending on where you audition. Typically the audition begins with a chat where you can ask questions and get to know the teachers. Be yourself and don’t fluff. You then perform both monologues. They may ask you to do a monologue again with some new direction. Take this direction on board. Recall. If they like your work you will be recalled a few days later. The recall involves performing the monologues again and working with some of the other auditionees. They want to see how you interact, so be open and responsive to direction. Where are the auditions: the auditions are held in the capital cities of all the states: Brisbane, Sydney, Melbourne, Perth and Adelaide. For most people, your first audition, won’t be your last audition. Some people get in the first time, but most try out two or three times before they get in. Don’t be afraid or concerned about this. Remember the quality and exclusivity of the course is what makes it so great, and there are only 9 places for females and 9 for males, so don’t beat yourself up about it. It’s frustrating, but if you love the craft it shouldn’t stop you from pursuing it. It is just a bump in the road. If you don’t succeed first time, make sure you continue to explore acting and developing your craft, as your efforts to better yourself in between auditions will be looked on favourably by the audition panel (who will probably remember you from last time). If you do nothing to pursue acting before your next attempt, the panel will question your commitment to acting, which will definitely not help you succeed the next time. Whether this is taking some classes, doing some indie theatre or film work, or seeing every production you can, your pursuit of the craft will be noted. Acting school isn’t for everybody, but it can really open doors for your creativity and for your career. So if you want to take the plunge and try out, commit to the audition process 100%, and at the very least, you will learn from the audition and from watching the panel direct and redirect so you are better prepared for next time. Getting into a top drama school can be tough, but remember that you can always audition next year. Try to learn from each experience, rather than beating yourself up if you’re unsuccessful. We wish you all the best! If you’re unsuccessful auditioning for drama school, check out StageMilk Drama School. 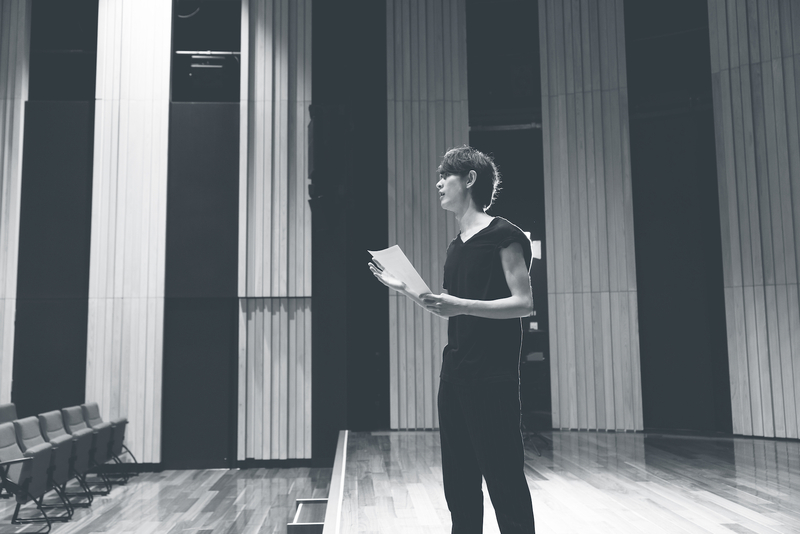 We built the course to be a great preparation for drama school. It’s an easy way to learn more about acting and get ready for next year’s audition.